MEN'S MINISTRY THIRD TUESDAY BREAKFAST Holy Week Reflection & Breakfast Tuesday, April 16, 6:30-8:30AM Chapel & Chapel Patio RSVP by Sunday prior: vpc.church/men Men, join us for a time of prayer and reflection during Holy Week. Coffee and continental breakfast will be available on the Chapel Patio. Come and go as your schedule allows. See you there! Guest speaker Michelle L. Rusk is an American author and speaker on coping with grief following suicide, especially that of siblings. She has written several books about the experiences of families following the suicide of a family member. BLOOD DRIVE You answered someone's prayer Deacon Health & Wellness Ministry Blood Drive Results Thank you to all who donated blood at the Vitalant Blood Drive on March 31! We met our registration goal, and took in 24 successful whole blood donations. Donations were distributed to local hospitals. Only two Sundays remain before Phase One of A New Heart for the Valley begins! We anticipate closing the Sanctuary and most of the northern end of campus after Easter. Be on the lookout for construction updates during the process! CONSTRUCTION WORSHIP SCHEDULE: Begins Sunday, April 28 8AM- Chapel 9AM- Landes Center 10:45AM- Landes Center (note time change) SANCTUARY TRIVIA: How high is the sanctuary ceiling? Bonus: The stones that make up the Sanctuary walls were quarried in what state? Find the answers below! ICM Food Drive: Bags available today on the patio Return full bags Easter Sunday, April 21 Chris Woodard: chrisw@vpc.church ICM Food & Clothing Bank meets the basic needs of up to 150 families every day. Please take a bag with you when you leave today and return it full on or before Easter. Sanctuary Pew Removal Volunteers needed! April 22-May 1 Keith Kerber: keithk@vpc.church We're asking the VPC community to help remove the pews from the Sanctuary, which will help save over $15,000! Everyone is welcome to volunteer, no special talents or tools are needed. There are several work times planned during the 10-day window, email Keith to sign up! We welcome requests confidentially for you or someone else. Please have permission from the individual before placing your request. Visit VPC Session page! 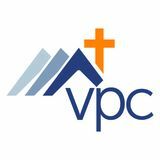 vpc.church/session Read bios and see photos of the Session team. You're invited this week to witness the end, and the beginning, of Jesus' journey. 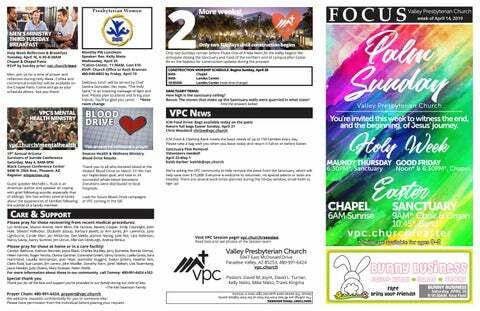 Look for future Blood Drive campaigns at VPC coming in the fall. Holy Week and Easter are both intimately personal and sweeping shared events that make us stop and ask fundamental questions about our place in God's creation. Who was this Jesus that threatened the powers-that-be so much He was killed? What does it mean that His death is counted as a substitute for mine? How should I aspire to be like this Christ, who overcame death itself? Join us this week at VPC to find out. We will continue to look at the amazing life and ideas from one of the 20th Century’s most incredible minds. Not able to attend Part One? No problem! All are welcome.